Few people are fond of the noisy, elephant-like CPAP machine – a clunky tool used for sleep apnea treatment. Fortunately, there is an effective alternative to the CPAP machine, simply called an oral appliance. If you live in the Indianapolis or Carmel area, you can treat sleep apnea without the CPAP machine by visiting Newman Family Dentistry. This article discusses the benefits of using oral appliance therapy as an alternative to CPAP treatment. It doesn’t let them move around comfortably, making it difficult to fall asleep, and making it more likely to awake with aches and pains. It can be noisy, which is bothersome to the patient and their sleep partner. When traveling, the CPAP machine can be a nightmare. It’s bulky and can be fragile, so it must be painstakingly transported with care. The straps and facial seal of the CPAP machine are ugly, uncomfortable, and cause pimple breakouts, rashes and dryness. 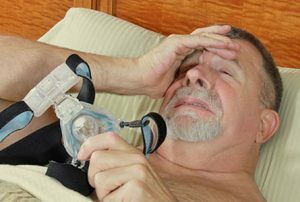 Because of problems like these, sleep apnea patients often remove their CPAP masks after only a few hours into the night, and many patients discontinue CPAP treatment altogether. These patients remain at risk for high blood pressure and heart attack, but still have to pay the bill from using a CPAP machine. Comfort. Instead of covering half the face and restricting head movement with a hose, oral appliances are easily worn in the mouth. Patients adjust to oral appliances much more easily and quickly. Easy transport. Oral appliances are about the size of a mouth guard. They easily fit in a small case that could be carried in a backpack or pocket. High success rate. Oral appliance patients don’t have to tolerate air being pushed down their throat, and they don’t wake up with a dry, stuffy nose and a rash around their mouth. Since all these issues are avoided, it’s much easier to have success with oral appliance therapy. If you’re looking for sleep apnea treatment using oral appliance therapy in the Indianapolis or Carmel areas, there is a solution! Contact us at Newman Family Dentistry today for a consultation.